Durita Dahl Andreassen and some of the other 49,188 people who live on the Faroe Islands, a remote archipelago in the North Atlantic Ocean want people to come visit. I guess if you had to see the same 49,000 people day in and day out, you’d want visitors too. Since Google won’t get out there and do a Street View to lure in tourists, Andreassen and her helpers decided to do it themselves. However, they didn’t stick cameras on their cars or wear backpacks to do this. 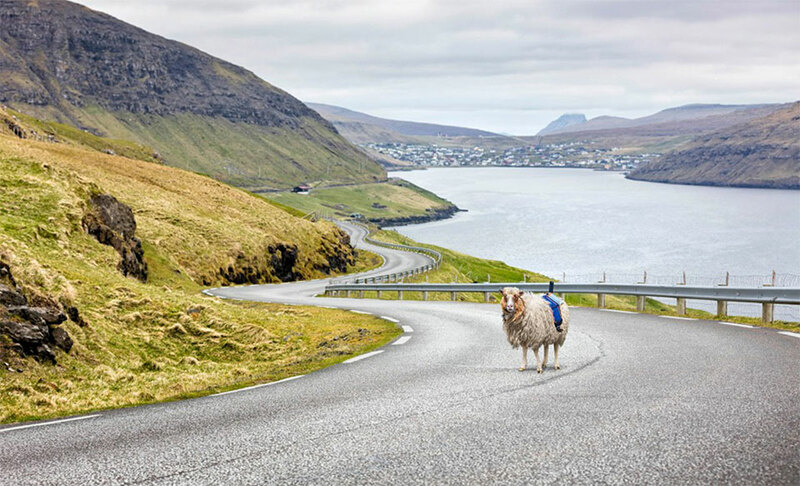 Since the Faroe Islands have about 80,000 sheep roaming around, Andreassen chose five of the wooly critters and strapped a harness onto the sheep that contains a solar panel and a 360-degree camera that stores GPS coordinates. 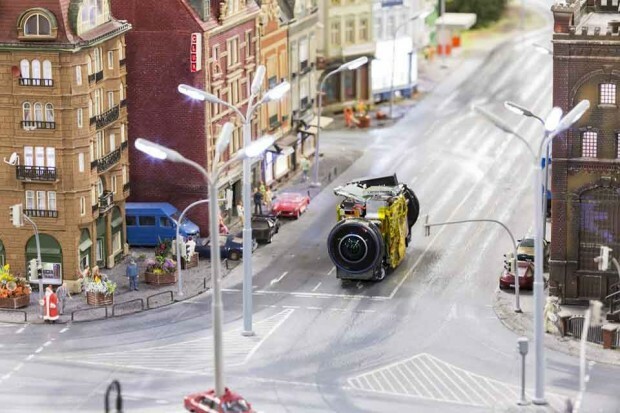 Located in Hamburg, Germany, Miniatur Wunderland is the world’s largest model railway, occupying nearly 14,000 sq.ft. and inhabited by more than 200,000 Lilliputian citizens. 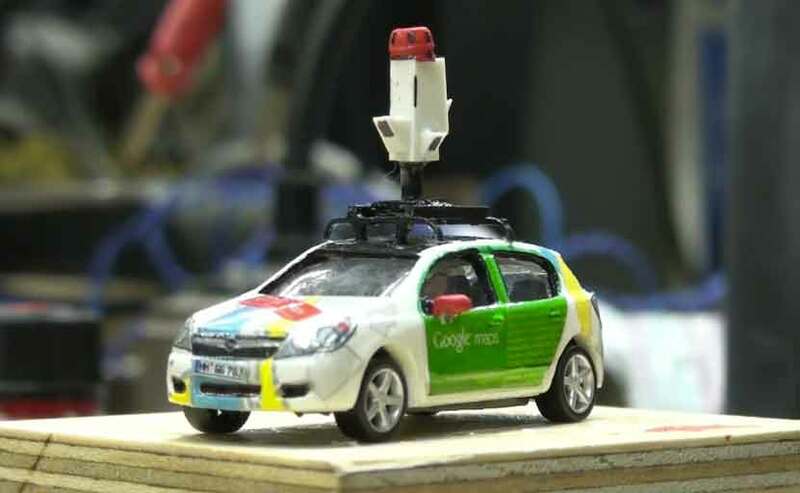 Now we can check out its sights and details at our leisure, thanks to Google’s first ever mini-Street View. Pack your miniature bags and head to Google Maps for a full tour. The tech giant is looking to continuously improve its products, and the acquisition of 360-degree photography startup Digisfera suggests that Street View will become better in the foreseeable future. Founded in January 2011 by António Cabral and his son Manuel Cabral, the Portuguese startup focuses on panoramic images. Google is mainly interested in one of the two sets of tools developed by Digisfera, specifically Marzipano (which truth be told, really sounds like an Android version). Some of Digisfera’s past work, which surely caught Google’s eye, were the large-size panorama of the Maracanã Stadium in Rio de Janeiro, during the 2014 World Cup and a 360-degree view of the inauguration of Barack Obama as the US president. One of the immediate consequences of the acquisition is the discontinuation of PanoTag, DigiSfera’s other tool, which enabled photographers to tag their panoramas, and thus increase their potential of going viral on social networks. The PanoTag servers will remain operational until October 31. 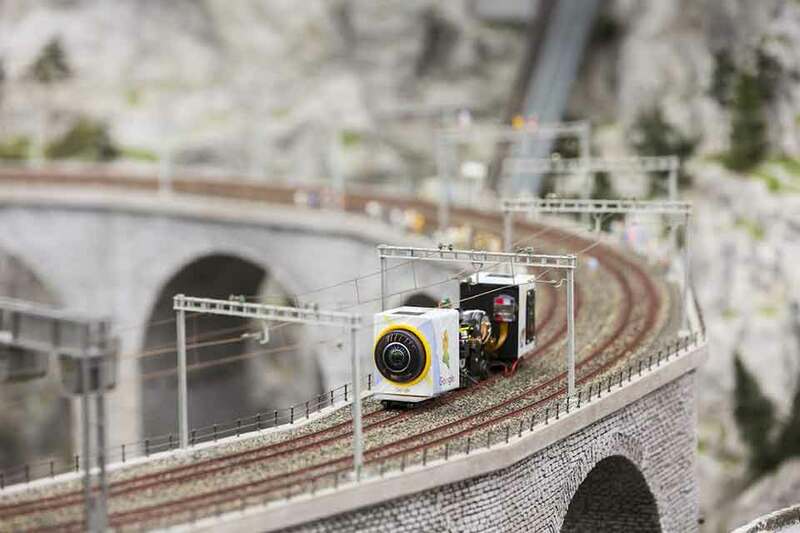 Marzipano, on the other hand, allows photographers to create virtual tours via a set of panoramas. Most importantly, the virtual tour can be exported as a web application. “In the coming weeks,” Google intends to open-source Marzipano, a move that “will benefit the panoramic photography community,” according to Digisfera. The startup’s engineers will be working on Street View, which really was the entire point of the acquisition, but it is currently unknown whether the two founders will join Google, as well. Other details pertaining to this transaction, such as the acquisition price, are currently unknown, mainly because Google has declined to comment them. “We’re excited to share that Digisfera is joining Google. We started Digisfera almost five years ago and have had the opportunity to work in many interesting projects involving 360º photography over the years. We’re excited to join the Street View team at Google to continue building great experiences using 360° photography. As we move on to our next adventure, it will no longer be possible for us to keep developing PanoTag, so it is being discontinued. We are planning to open-source our Marzipano viewer in the coming weeks and hope this will benefit the panoramic photography community. Between this and the continuous development of Mountainview’s driverless car, it’s getting clear that Google Maps has a very bright future ahead. If only offline turn-by-turn navigation was implemented earlier. Google’s acquisition of Digisfera may also have an impact on the tech giant’s desire to bring Street View photography into the classroom via virtual field trips. This acquisition didn’t pass unnoticed, and some feel that Google should spend more time and money on making their Earth and Maps 3D views better, instead of focusing on 360-degree virtual tours for Street View. Be social! Follow Walyou on Facebook and Twitter, and read more related stories about Google’s acquisition of Green Throttle Games, or Google’s acquisition of Lift Labs, maker of tremor-canceling smart spoon. If you have ever watched an episode of Mythbusters, you know who Adam Savage is. He is the ginger that builds so many of the contraptions that smash myths – or prove them correct – on the show. 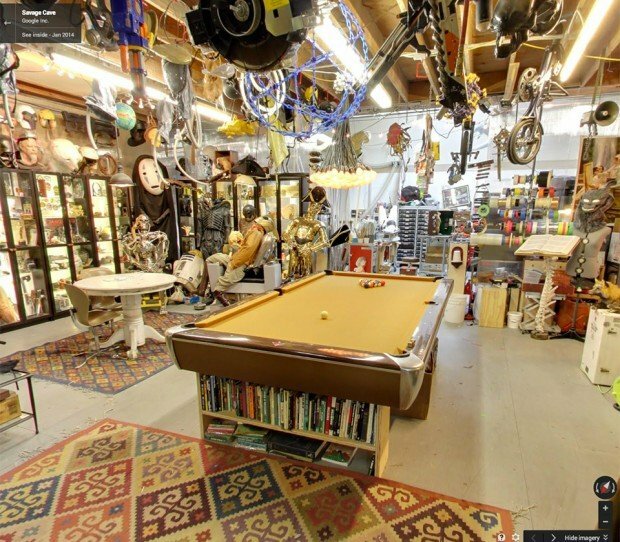 He also has an awesome man cave, as you might guess. If you ever wondered what his personal workshop looks like, thanks to Google Maps Street View, you can now check it out. 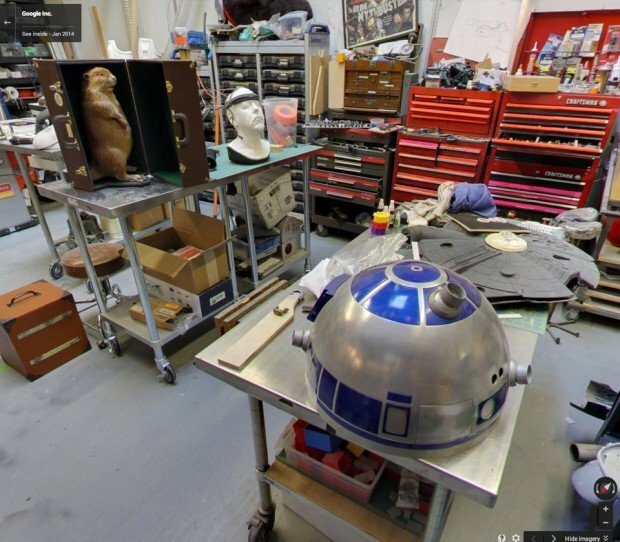 It’s a very cool place complete with full-size C-3PO and Chewbacca statues, an Atari Millipede arcade game, and thousands of awesome and creepy props and masks from movies, TV shows and commercials.Heck, he’s even got Hellboy in his bathroom. Savage also has a YouTube video up where he goes over exactly what is hidden away in his space. Check out the video below and see all of what this sweet place of things manly and geeky has to offer – then head to Google Street View and start exploring for yourself. The post You Can Explore The Colorado River In Google Street View appeared first on OhGizmo!. Google's Street View may have already taken us on a virtual tour of some US national parks, but its total number of natural sites now sits at an impressive 44 US and Canadian locations. With permission from the US National Park Service and Parks Canada, the search giant's cars, trikes and backpack-worn Trekker units have mapped some of most picturesque and historical sites in North America, providing us with new 360-degree views of Mount Rushmore, the Alamo Mission in Texas and the crystal-clear lakes of Banff National Park, to name but a few. All of these different locations -- with multiple trails -- are online now and you can check them out by hitting the source below. I’ve always found it curious that the entire city of Venice, Italy is built on the water. The way to get around much of the city is by boat, and the main thoroughfares are canals between different buildings and walkways. As close as I’ve ever gotten to exploring Venice, Italy is watching James Bond chase bad guys around the city. 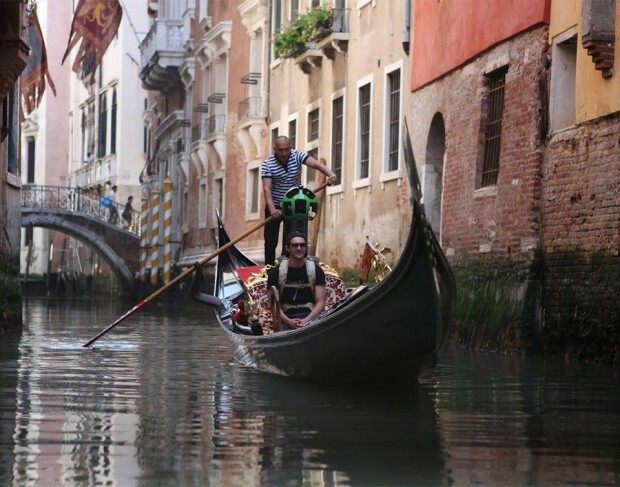 If you want to explore Venice, but can’t afford the airfare, Google has announced that its Street View imagery is now available for all of the canals and walkways of Venice. To grab the Street View imagery, Google workers used their Trekker Backpack and covered 265 miles on foot and 114 miles by boat. Google says that it covered all the major attractions in Venice and also covered some of the lesser-known features including the synagogue of the first Jewish Ghetto and the Devil’s Bridge on Torcello Island. Google has even offered up a behind-the-scenes video showing how it captured some of its Street New footage in Venice. This is way cooler than those Street View images of CERN and the Large Hadron Collider. In the same way that you can't really call The Hitchhikers Guide to the Galaxy a trilogy any more, Google's once again stretching the definition of a street. The company has loaned out one of its backpack-worn trekker units to the UK's Canal and River trust, which will document 100 miles of the country's waterways for Street View. Users will be able to tour London's Regent's Canal, the Bingley Five Rise and the Stoke Brueme blacksmiths on the Grand Union Canal. Just remember folks, even if you're touring from the comfort of your laptop, it's not a proper rambling holiday unless you bring a packed lunch and a flask of weak lemon drink.